A winter vegetable I just can't get enough of right now is the PARSNIP! A root vegetable similar to a carrot yet paler and sweeter. Prior to the staple potato the parsnip was actually the main source of starch in diets as they had a long storage life, a sweet flavour and nutritional value. Parsnips grew in Europe and in Roman times parsnips were believed to be an aphrodisiac and a luxury item for the aristocracy. 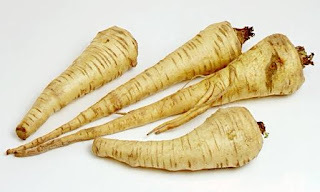 The Europeans brought parsnips to the United States in the 16th century, but to this day they are still not as popular as the carrot - although they are truly superb. Interestingly, parsnips are NOT grown in warm clients, as frost is actually what helps develop their flavour - the cold converts the starch to sugar, sweetening the parsnip and mellowing the flavour. My favourite ways to enjoy parsnips are either roasted or in a soup! 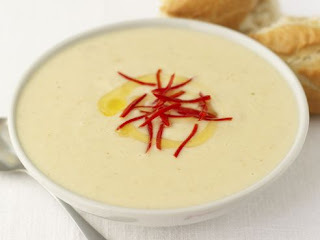 Parsnip soup is one of my ultimate favourites! Try Jamie Oliver's Spicy Parsnip Soup! - Heat a splash of olive oil and the butter in a large saucepan. Add the onion, garlic, ginger and garam masala. Gently fry for around 10 minutes, until the onions are soft and sweet. - Drop in the chopped parsnip and stir together so that everything gets coated in the oil and flavours. Pour in the milk and stock, season well and bring to the boil. Turn down the heat and simmer for 30 minutes with a lid on. - After half an hour, check that the parsnips are cooked by sticking a knife in. If you’re happy, remove them from the heat and carefully whiz up using a hand blender or liquidizer. Taste the soup to see if it needs a little more salt or pepper. - Serve with a sprinkling of sliced red chili, a few coriander leaves if you like, and a good chunk of crusty bread. - Tip: Use coconut milk instead of regular milk for a twist. To roast parsnips cover peeled and sliced parsnips with oil, salt and pepper. Place on a baking sheet at 400 degrees for about 35 minutes, or until they turn golden brown with the roasted look!